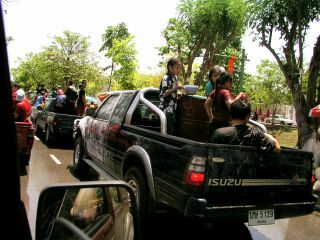 The whole center of the city comes to a complete standstill during Songkran week which runs either side of April 13th. The revelleries normally start at about 11am and continue until early evening. During this time the traffic speed drops to well under 1Kmph. We therefore try to complete our business well before lunchtime, so we can return home and hide in relative safety. This is the most dangerous time of year to be out and about in Thailand. Huge numbers of drunks turn the Kingdom's roads into scenes of carnage. This photo was taken through the side window or windscreen of the car as we got caught in the jam. 45 minutes to go about 300 meters until we could escape along some less-packed side roads.